A strong and bold online presence representing your business is a must thing to have while initiating a business of any kind. And for that, one must build a solid website and provide all the essential information and features needed for their users. 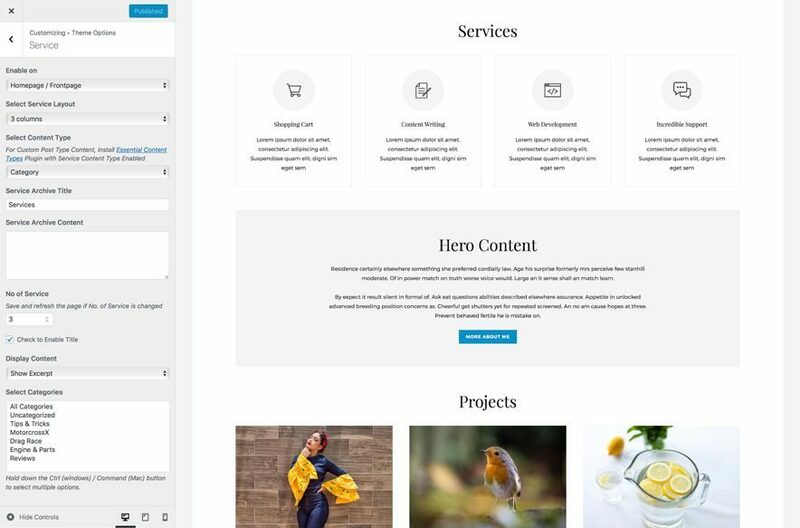 Blog and corporate WordPress themes are actually life savior for those trying to build a business website or people looking for a theme with all the basic features in it to start a business online. 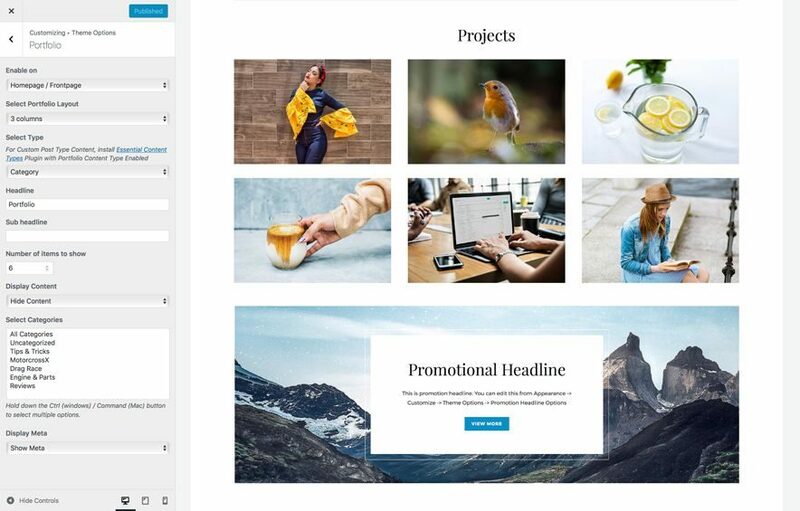 Moreover, blog and corporate WordPress themes are very flexible and give you an opportunity to personalize your website to effectively represent your brand, company or organization. In order to help you promote and run your business online, we’re very delighted to bring you our new responsive Blog and Corporate WordPress theme – Catch Inspire Pro. 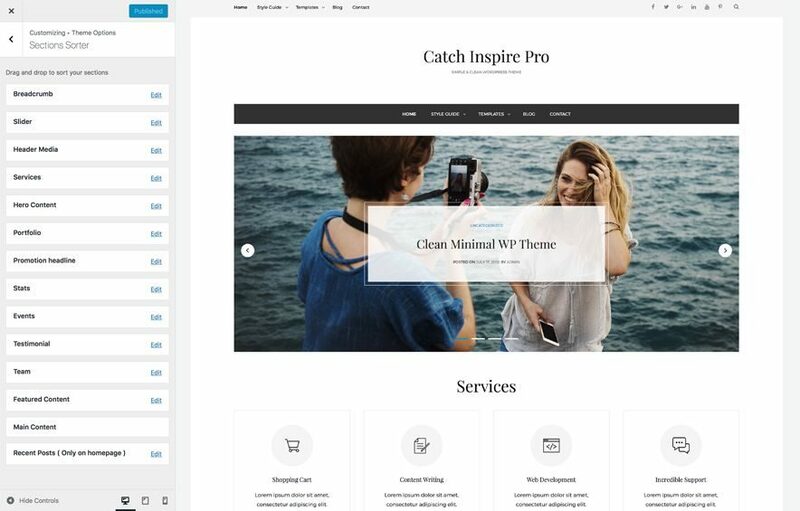 The main inspiration behind crafting our new blog and corporate WordPress theme, Catch Inspire Pro, is one of our first releases—Catch Box Pro. It is a simple, lightweight and box-shaped responsive WordPress theme. The theme can be used to create business and blogging websites and it ensures that your content is always displayed beautifully across all devices. Our new Blog and Corporate WordPress theme has also been crafted in a way that is suitable for ecommerce websites. So, you can also build a WooCommerce marketplace for your visitors. Catch Inspire Pro is an advanced version of Catch Box Pro. It comes with advanced features and functionalities for your blog and business website to stand out among the mass. 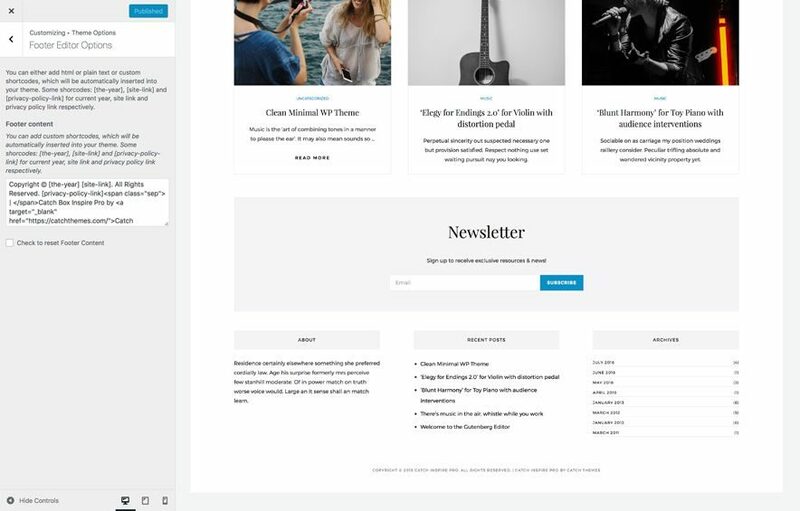 Catch Inspire Pro is a clean, simple and feature-rich responsive Blog and Corporate WordPress theme that is ideal for creating any type of business website elegantly. It has been deliberately designed to accommodate the ample requirements of an extremely vast set of different business website archetypes. 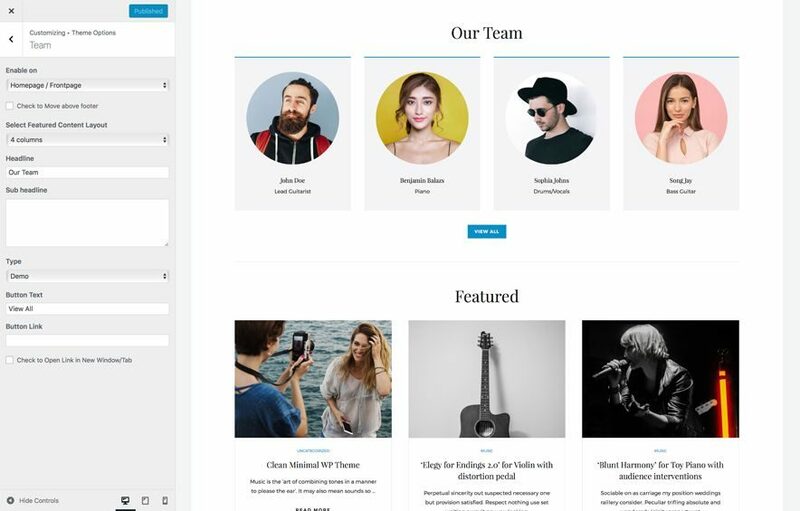 The theme is completely responsive and comes with features fit for promoting your business, products and services, the ability to create a professional blog, social media integration, eCommerce support and more. Our new blog and corporate WordPress theme, Catch Inspire Pro comes with an array of basic and advanced features that are crucial for blog and business websites, such as featured slider, featured content, font family options, footer editor options, header top options, hero content options, portfolio, promotion headline, sections sorter, service, stats, team, testimonials, and more. With these incredible features, you are empowered to create a simple, elegant and strong business website in no time. 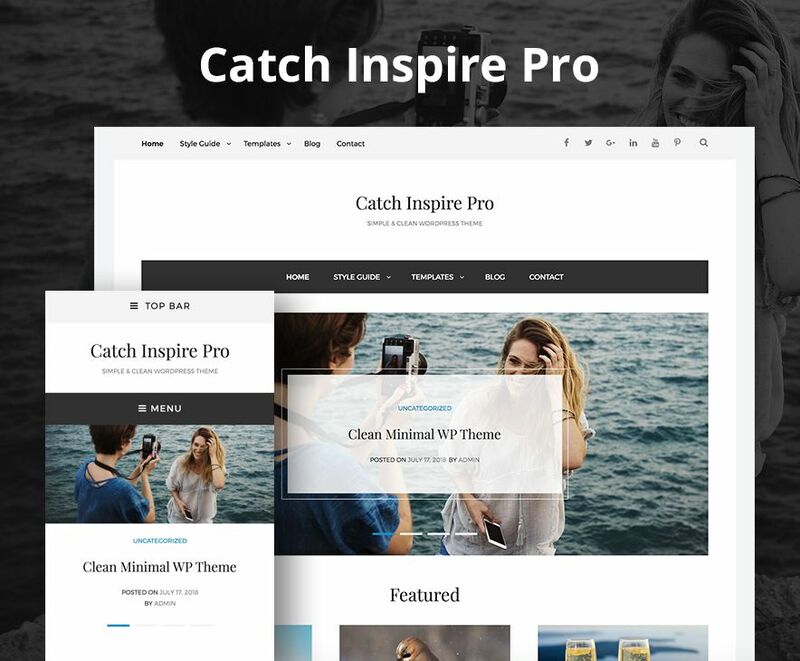 You can choose Catch Inspire Pro for your blog, corporate, or eCommerce website. Sections Sorter allows you to organize various sections on your website by manually arranging them. You can now rearrange and put forward the section that you want your visitors to see first. Simply drag and drop the sections to your desired position and display them orderly. Also, another cool feature in this option is that you can not only rearrange the order but also can quickly edit those sections from Sections Sorter option if you want any quick changes. If you want to grab the attention of your viewers in the business field, then the Featured Slider in Catch Inspire Pro makes your job easier. You can place your impressive posts, pages, categories and images that you want to highlight on your website with Featured Slider. Also, there are a number of customization options and transition effects to make your website more attractive and impactful. 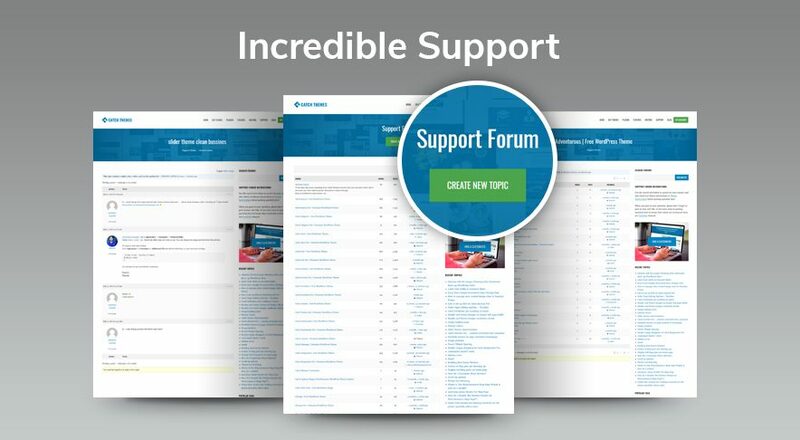 Catch Inspire Pro supports Featured Content. It allows you to highlight your recent and popular posts on your website. Featured Content can be displayed in 1 to 4 columns. It can either be displayed on Homepage or the entire site. You can add your title and archive content for featured content, select the number of featured content, display Meta, select multiple categories, and enjoy displaying your popular posts. Catch Inspire Pro gives you the power to choose different types of stylish fonts for your Site Title, Tagline, Headline Tags, Content Title, and Content Body. Choose the font that suits best for your website from the font options and make your website more attractive. The Header Top Section is a small section just above the header. It allows you to add your email address, contact number, and address to display on your website. You can also take it as a shortcut section on your website to help your visitors know more about you and your work more quickly and efficiently. Also, you have to option to enable the search option and date in the header top section. 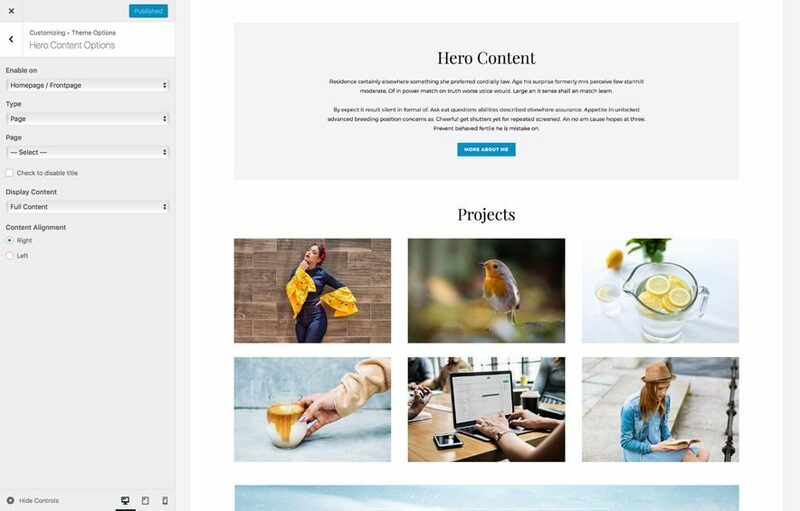 This blog and corporate WordPress theme allows you to display the best assets of your website with the Hero Content Options feature. This feature allows you to highlight content, posts, page, categories, and images you deem most important in a fashion that is easily attention-grabbing. Displaying your strengths has never been so prominent. 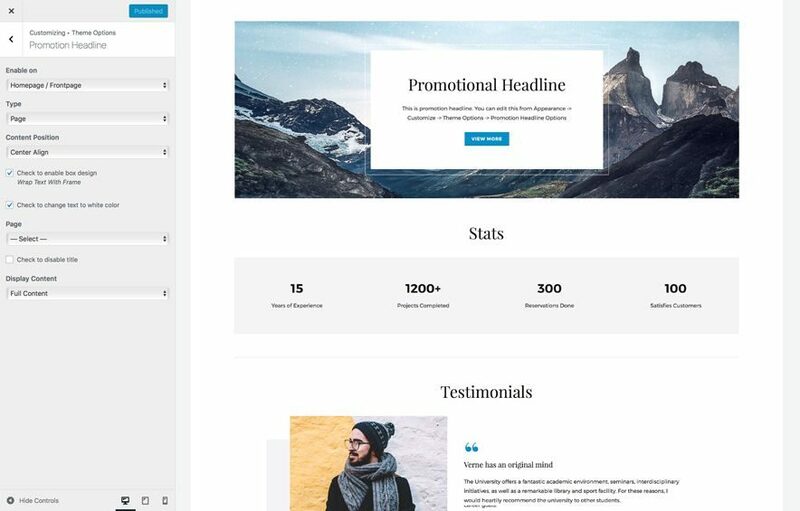 Catch Inspire Pro, the new blog and corporate WordPress theme allows you to add a completely customizable Promotion Headline. You can choose the content type—post, page, category, or image—that you want your visitors to see or read at any cost. Also, you get to choose the content position as well. Every website owner wants people to know about the services they provide. With Catch Inspire Pro, you can now place the services you provide right on the spotlight. Choose to display the services in 1 to 4 columns. Display the services on the homepage only or on the entire website. The Stats section allows you to display your strengths to your visitors in numbers. Your first-time visitors are likely to build trust in you and your business only after knowing that you’re excellent at what you do, what you deliver and your services are of a top-notch. And, in order to showcase the achievements of your business, the Stats section serves you well. You can display your website statistics in up to 4 columns, add title and sub-title along with a few other customization options. 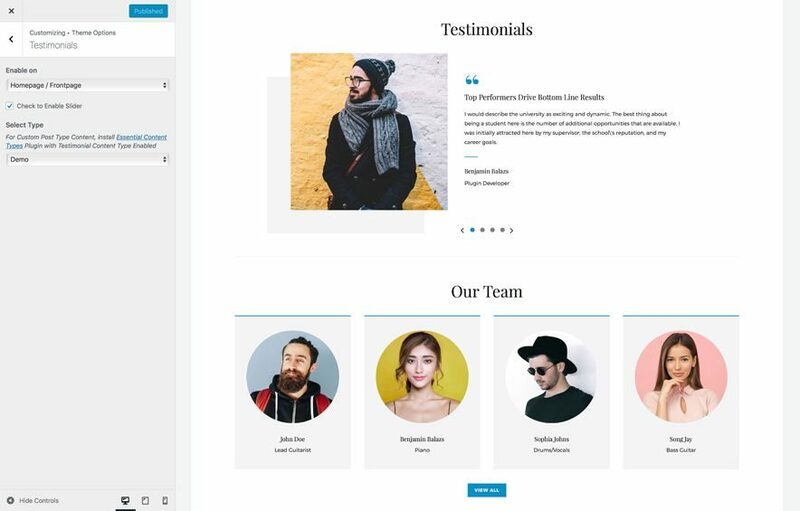 Our new blog and corporate WordPress theme, Catch Inspire Pro allows you to display your team members in an informative and elegant manner. 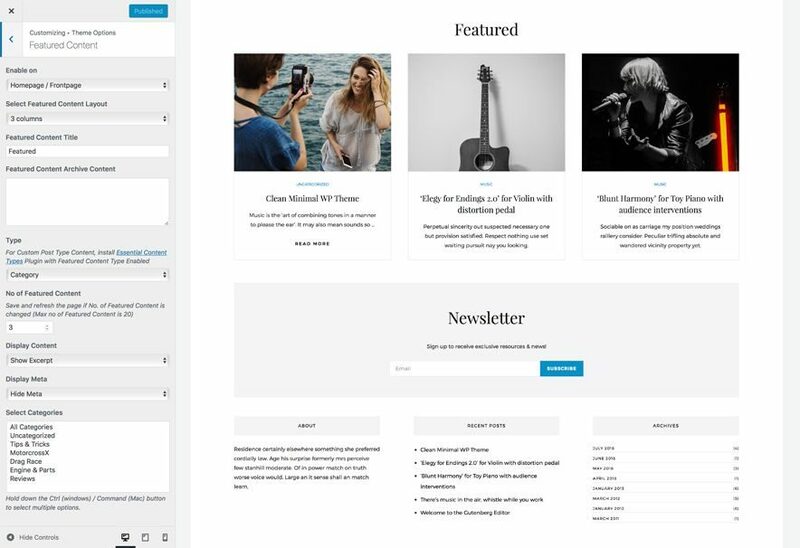 You can showcase your members in 1 to 4 columns with Headline and Sub headline for the section. You can select your content type (post, page, image, or categories) as well. Team – A great way to appreciate the efforts of your team members! People are really after authenticity. They want to know what your goods or services are really like. Customer testimonials genuinely assist in building trust. Catch Inspire Pro allows you to display testimonials on Homepage, the entire site or disable it completely. 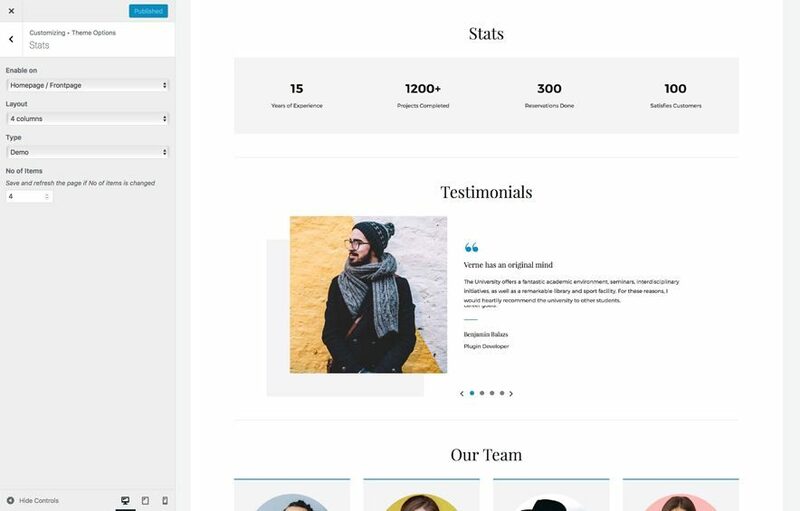 You can even select your testimonial layout type. Our code is secure and optimized. We do proper data validation and sanitization and follow core theme guidelines. 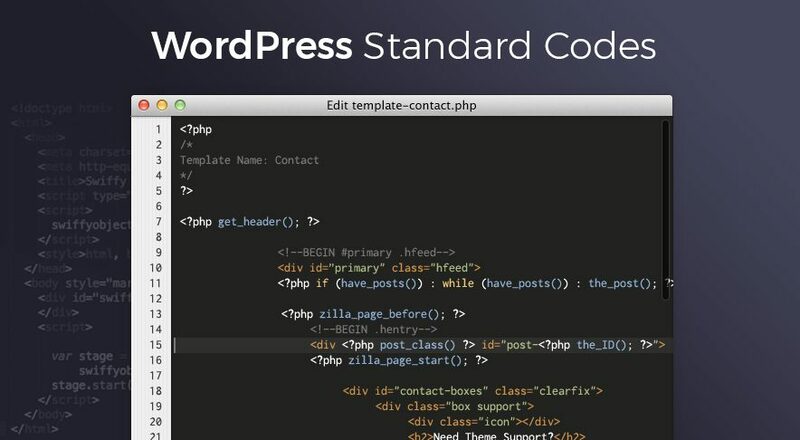 Our developers are active contributors to the WordPress theme review and WordPress core. Our themes will always be updated as things change in WordPress. 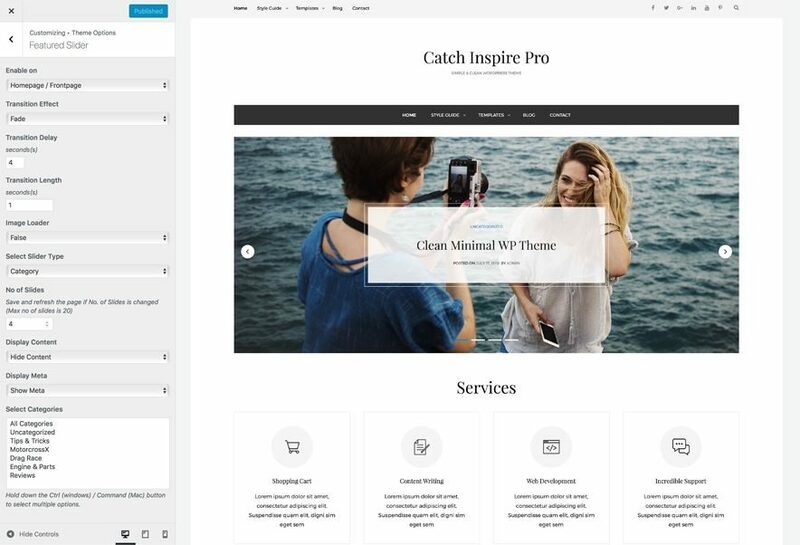 Advanced SEO support has been integrated into Catch Inspire Pro —a blog and corporate WordPress theme. This allows managing page’s meta-data and heading tags. This is important because SEO optimized pages can help you and other viewers find your site easier on the web. Our support team provides extensive support documentation. Our theme documentation answers most questions about using this blog and corporate theme. If you are still having difficulties, you can post in our “Support” forum, and a member of our team will get back to you shortly. You can also hire our theme customizer for advanced customization of your theme. So, all in all, if you’re looking for a theme that facilitates you with all kinds of features that a striking business website of any kind consists, Catch Inspire Pro is the ideal pick for you. From creating a simple blogging website to remarkable business or eCommerce website, Catch Inspire Pro has it all to make your website more creative, distinct, and noticeable. Our new blog and corporate WordPress theme comes with extensive typography options, a highly customizable layout, and several cutting-edge features. It is fully responsive and equipped with the best features you can use in constructing an effective business website. Catch Inspire Pro is super user-friendly, has a very easy working interface and saves so much time with zero need for coding. Buy Catch Inspire Pro now and make your business stand out in the digital arena! You can check out the live preview of Catch Inspire Pro here. We also have a free version of this theme. However, the free theme comes with lesser features and functionalities. You can check it out by clicking here. I tried to purchase the Inspire Corporate theme, but was only given the option to buy Inspire Pro. I couldn’t find any way to only buy Inspire Corporate, so I assumed that by purchasing Inspire Pro there would be a theme option for Corporate. If there is, I can’t find it. Is Inspire Corporate just a different template in Inspire Pro, or a separate product on its own? 3. Then, enable search in header top. For that go to “Appearance => Customize => Theme Options => Header Top Options” and then check in “Enable Search” and Publish. 4. Then you can go to “Appearance => Customize => Theme Options => Featured Slider and enable slider as per your need. 5. Then again go to “Appearance => Customize => Theme Options” and play with various section you want. You can check theme instructions and FAQ section for instructions. Then if you still have issues, please post in our support forum.